Alright, I can hardly contain my excitement. I'm TICKLED PINK that Lysa TerKeurst is running a contest through her blog in which she is giving away scholarships to her She Speaks writing and speaking conference this summer!! The conference offers top notch instruction for women who have writing and speaking written on their hearts and want to learn how to hone their craft so that they can use it to reach and encourage others. Seriously, I'd rather win this scholarship than the lottery, because that's how much I'd love to attend this conference, but had completely written it off due to our financial situation and my busy mommy life...and, I've heard that people who win the lottery become miserable anyway. In order to be a participant I'm supposed to tell you about how I came to want to attend this conference...It's sort of a longish story, but one of those threads that is woven into my life that has God's name ALL over it. Anne Lammott wrote this essay in one her books (unfortunately, I couldn't find the exact reference...I did dig through three or four unpacked boxes still sitting in our basement before giving up), about our lives sometimes being like that of a frog trying to cross a pond. The pond, as a whole, can be overwhelming, but if we just leap from lily pad to lily pad, one step at a time, well, we will eventually reach the other side. That is how my writing and my desire to write has felt...overwhelming, like the big, open, muddy pond, but I'm trying to hop from pad to pad, and focus on one day at a time. hop...I was an English Major because I loved to write. hop...I attended a graduate program in print journalism because I naively thought I was going to be the next big Vanity Fair profile writer (lol). hop...I took a job at a big publishing company, because I was excited about the idea of being one step closer to authors. 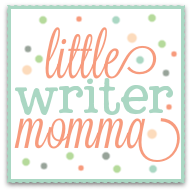 hop...hop...plop...Meet Lisa Littlewood, wannabe writer, becomes mother and meets post-quarterlife, not quite mid-life, identity questioning crises. I had a baby and felt like I had fallen off all lily pads into a murky abyss of an ocean never to be seen again...I'm being a little dramatic here, but doesn't motherhood feel that way sometimes? I know I referenced this in a recent blog, but like you truly have fallen down the rabbit hole into wonderland and you're not quite sure where you are or who you are in this new place. Slowly, I began to re-align myself within my new role as a mom and was trying to integrate my desires to write. I read several books on freelancing, I sent out queries, I accumulated magazines into towering piles so that I could read through them, disseminate them and figure out my best target market. I also changed diapers, took walks, read board books, cleaned up toys, washed clothes, got pregnant again, had baby number two, cleaned up more toys, lost more sleep, made more meals, washed more high-chair trays. ...and then found out my husband was accepting a job in Buffalo (we were in Massachusetts at the time, but our family was in Buffalo)...so I started packing, one box at a time, our entire house, while nursing, and cleaning, and picking up toys and changing diapers and then we moved all of our belongings and said goodbye to the house we had brought both of our children home to and drove to Buffalo and lived with my in-laws for three months...oh, it makes me tired just to write about it. In the midst of all of this, however, God was working on my heart. He knew, has always known, my hearts desire to write in a way that would encourage others and shed some light in this sometimes darkish world of ours. God started leaving little notes, little signs along the way to affirm that despite my feeling like I might never be able to pursue my passions along with my role as a mom, that he was alongside for the ride, and maybe even had a few ideas about how I could combine the two. The nudges started started with my friend Mary, our pastor's wife, in Massachusetts, who came up to me one morning at church in 2007 ) and said, "Lisa, I just got back from this awesome conference in North Carolina, you HAVE to try to go next year! Check them out online- it's Proverbs 31 Ministries." "Lisa, you know that women's retreat they're having through The Chapel (her church, now my church too...neither of us were going to go and registration was closed), someone from the church just called to tell me that they have a couple of spots open. I'm thinking about going, why don't you come." I quickly checked it out online. Keynote speaker: Lysa TerKeurst, Proverbs 31 Ministries. I called Katie back and told her I wanted to go. We get to the conference, which is a wonderful weekend in and of itself. Lysa was wonderful, the worship was wonderful, and I was feeling very encouraged. At one point I stopped at Lysa's table and happened to come across Holly, whom I started chatting with. I told her I had heard about the She Speaks conference, that it sounded really amazing and that it is my heart's desire to write. She said that was really great, that I should check out their magazine and that I should also start a blog. She said that is how a lot of their speakers/writers had learned to really develop their voice, style and hone their writing. The blog thing had been on my mind and so I took her words to heart and put them into action. I started this blog towards the end of last year as a way to practice writing and to hopefully encourage others along the way. At my MOPs meeting Thursday morning (which I almost didn't make because of a sprained ankle), my friend Laura (who happened to be the guest speaker) said, "Hey Lisa, I was thinking about you yesterday. 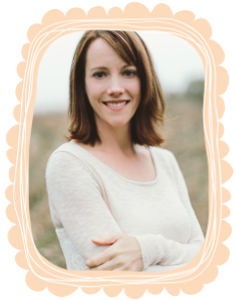 You know Lysa TerKeurst's blog?" (I won't lie, life has been crazy and I hadn't been following consistently!). "Well, apparently she is running a contest this weekend and giving away scholarships to her writing conference!" "You totally need to get on and enter the contest." So here I am, writing my story, because God planted a desire in my heart long ago, Mary told me to check out the web site, and Katie told me to come to the conference with her at the last minute, and Holly told me to start a blog, and Laura told me that Jaime had told her that Lysa was running a contest on her blog and that I should enter! Nudge. Nudge. Nudge. Nudge. Nudge. 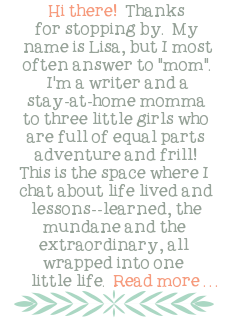 It's like God keeps putting His peeps in my way to say "Hey, Lisa, listen up...I have something for you that is totally going to be the key to melding your hearts desire to write and encourage other women and it will even jive with your new role as mother!" The truth is I had been watching for the details of this year's conference to be posted on the Proverbs 31 web site since last October when I saw Lysa speak. When the conference information finally came out I realized it was most likely not going to be something I could afford to do this year-- maybe something I needed to do down the road...I won't get into financial drama here...but we'll just say, we have a long way to go in our current debt reduction plan...the conference, plus air fare was going to just be too much this year. All that to say, even though I had written it off, it still sat there in my heart..."Lisa, wouldn't it be really cool to go to that She Speaks conference?" It would. And I'd love too. And I don't entirely know how this whole bloggy contest is working except that I'm supposed to post my story and link it up to Lysa's blog on Monday. I'll let you l know what becomes of it all. Steep yourself in God's Word! "I delight in Your decrees; I will not neglect Your word. Your statutes are my heritage forever; they are the joy of my heart." What a cool story! Thanks for your comment on my blog :) Happy to meet you! Lisa, what a great story! I love the lillypad analogy! You are so correct on the "kerplunk" after children! Amen to that! I LOVE my MOPS group and am stepping in to be the coordinator next year. I'm so looking forward to serving God in this capacity. I enjoyed your writing and LOVE that you are a runner - I used to do halfies and ran the Chicago Marathon BEFORE KIDS but now, as you listed above, I can't find the time to fit it all in. I know it's just a season but I am so ready to get back out there again! Thanks for visiting my blog - I enjoyed yours as well!